Ahead of our 3rd Anniversary, we are excited to announce that our new “We Are The Borg” client, v7.0.9, is now live on Facebook and Steam. Starting tomorrow Wednesday, January 9, this update will also be available on all app stores/platforms. Be aware that it could take up to 48 hours for it to propagate. Version 7.0.9 (“Seven of Nine”) contains new features and changes; some of these will be available immediately after updating, while others will go live at a later date. - Cadet Challenges are now warpable! - Episode 9: Explore the challenges of Episode 9 to learn about the Borg and how they’re handling the Temporal Anomaly Crisis. - Resistance was indeed futile... the Borg will have their very own Faction with its own set of missions! - The Bride of Chaotica Collection has been updated to include a new crew, Lonzak, and a new milestone reward: a new Captain avatar showcasing Captain's Proton's ship! - Time Portal Update: the loot tables for Premium Rewards, Basic, and Merits packs now include the following crew. For Voyages, loot tables were updated with the 4* crew listed below. Convergence Day will soon be upon us! Tuesday, January 15 marks the 3rd Anniversary of the global launch of STAR TREK TIMELINES, known as Convergence Day! We will be celebrating in style with a free copy of a new 5* crew, Seven in Silver. 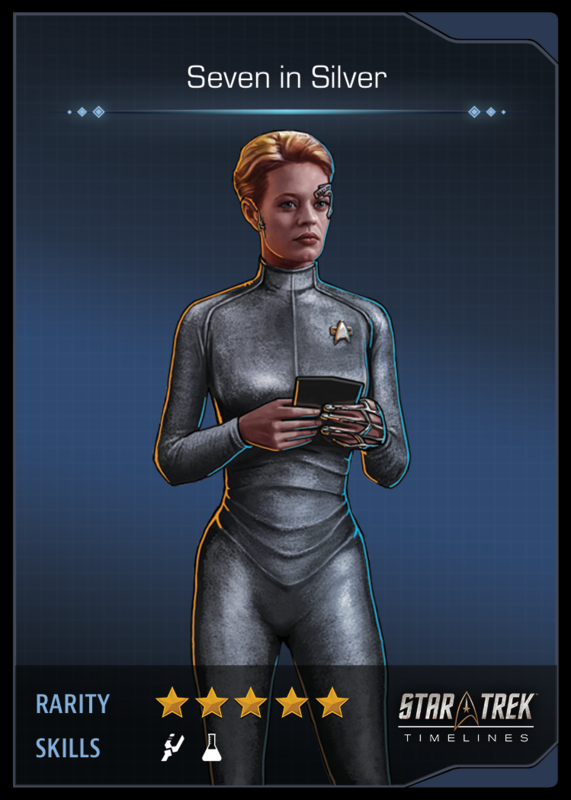 This version of Seven of Nine will be available for free in the Time Portal from Tuesday, January 15 until Saturday, February 2. Don't miss your chance to add her to your team! Also coinciding with Convergence Day, we’re excited to announce that Part 1 of our two-part Borg-themed event, “A New Lease,” begins on Thursday, January 10. The full details regarding this year’s Convergence Day festivities will be announced next week.